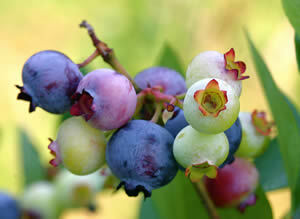 Blueberries are a naturally delicious treat that can be enjoyed without hesitation - a totally guilt free pleasure. 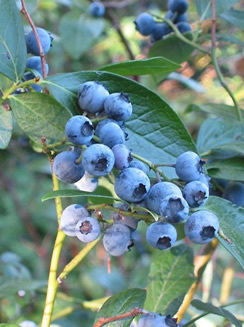 There are many different species of North American blueberries adapted to thrive in climates from Alaska (Vaccinium alaskaense) to the Carolina farkleberry (Vaccinium arboreum). Blueberries are of special interest in the functional/medicinal food category due to the high levels of anthocyanin and polyphenolic antioxidant compounds they contain. Blueberries have a higher antioxidant capacity (in some cases as high as 40-50 mmoles TE/g) than other healthy fruits and vegetables; by comparison, kale, strawberries and spinach have relatively high antioxidant capacities of 17.7, 15.4 and 12.6 mmol TE/g. Preparation Methods & Dosage :Eat fresh or frozen fruit in desserts, smoothies and as a healthy snack. Plant Class:Perennial Shrubs: Smaller or wild species are "lowbush blueberries" and the larger species are known as "highbush blueberries". Flowers/Fruit/Seeds: flowers are bell-shaped, white, pale pink or red, sometimes tinged greenish, fruits ripen from green to a dark blue, indigo when ready to eat. Leaves:Leaves can vary between deciduous or evergreen, ovate to lanceolate depending upon type. Distribution: Native to North America. Many different species spread throughout all latitudes of the north american continent.